So first, let’s take a look at this trailer, seen below. And of the many new bits and pieces found within it, two stick out above all others. The first is Captain Cold, one of the Flash’s biggest comic villains. We don’t get a ton of Cold (who’s real name is the always hilarious Leonard Snart), but we get enough of the basics. He’s played by Wentworth Miller and he has a gun that shoots super cold stuff. And then there’s a kiss between our Flash and Arrow‘s Felicity Smoak. That should certainly cause some tension the next time The Flash and Arrow cross over, considering that Oliver Queen (the lead character of Arrow) has been moving closer and closer to a relationship with Felicity. Will they form a superhero love triangle? Probably. Will it lead to some superhero infighting? Probably. 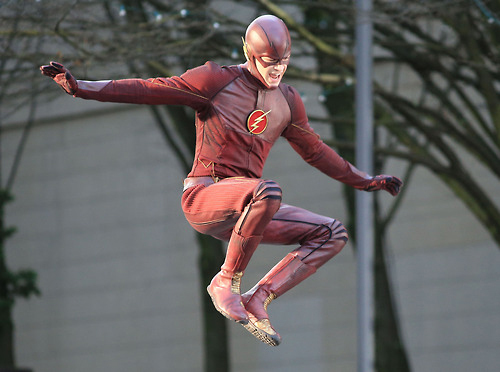 And will the Flash win that fight, because he can punch faster than the speed of light? You know it. But chances are it’ll be cool anyway. This entry was posted in Network Television News and tagged Arrow, CW, Grant Gustin, MindBender, MindBender Entertainment, Mindbenderent.com, The Flash, The Flash Premiere, The Flash Trailer, Wentworth Miller. Bookmark the permalink.